THE FINE GAEL leadership has given the party a boost in the latest opinion poll – with the party enjoying a five point advantage that sees them leading the pack. Fianna Fáil, meanwhile, are down seven percentage points to 21%, while Sinn Féin are down three to 15% according to the latest Sunday Business Post/Red C poll. Independent politicians, whose support fell in the last poll, have recovered to their original position – perhaps a showcase of how fickle polls can be. 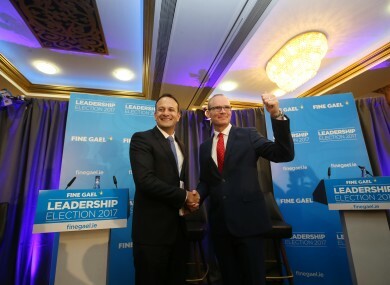 The poll was taken between 19 May and 25 May, during which both Leo and Simon geared up for the Fine Gael hustings from Friday to Sunday. Tonight’s hustings will be held in Ballinasloe, Co Galway and will be streamed live on the Fine Gael Facebook page from 8pm. Email “Leadership battle gives Fine Gael a boost in the polls”. Feedback on “Leadership battle gives Fine Gael a boost in the polls”.